Animation, Biochemistry, Bioinformatics, Biomedical Technology, Biotechnology, Climate Change Impacts Management, Clinical Research, Food Science and Nutrition, Forensic Science, Human Genetics, Infrastructure Management Services, Information Technology, Mobile Applications & Developmental Management, Maritime Management, Creative Science, Financial Services, Performing Arts, Networking and Communication, Web Technology, Communication & Journalism, PGDIFA, PGDFMI, PGDPM, PGDCSA, PGDACCP, PGDCR, etc. 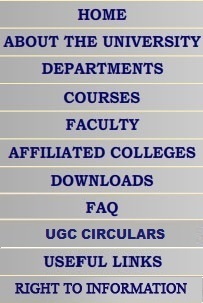 The academic capability and potential of the university is recognized by the globally reputed research organizations like PRL, ISRO, Plasma Research Institute, Entrepreneur Development Institute engaged in extended research activities of the university. The university has organized more than 200 seminar/symposium/workshop/conference/training course/conference/congress, etc. in collaboration with the state or central funding agencies. The university has a state of art Convention Centre with three exhibition halls to cater the needs of social/academic/industrial organizations to organize academic and industrial summits and conventions.